SYDNEY/TOKYO (June 2): Whether or not the land Down Under snaps its two-decade-long streak without a recession, a glance at the charts shows this past week has been a "septima horribilis" (to purloin and tweak from Queen Elizabeth II) for the world's 13th-largest economy. Iron ore is declining again amid worrying signs that China is wobbling, businesses are reluctant to borrow as they plan on cutting investment to a decade low. 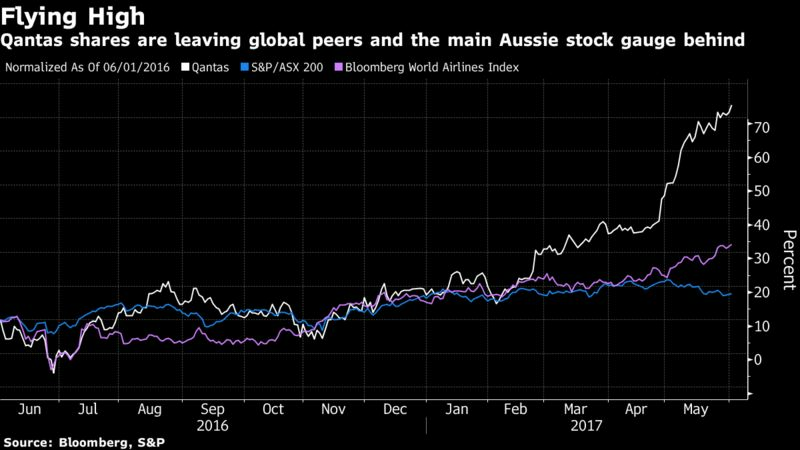 An unexpected rebound in retail sales and soaring stock prices for Qantas were rare bright spots. Markets are flashing red. The Aussie has dropped against all major developed counterparts this quarter and yet analysts are mystified at the currency's capacity to cling to its post-float average of about 75 US cents ($1.04) even as Australia's yield advantage evaporates. Stocks are lagging behind most of the rest of the world and swaps traders see the nation as the only major economy where interest-rate cuts are possible in the coming year. The following charts highlight the trends that have driven traders and investors toward despairing that Australia can finally make the transition away from a dependency on resource exports. The bond market is leading the charge when it comes to gloom about Australia, in a rally that has sent 10-year yields down for three straight months and put them just 16 basis points above similar Treasuries. 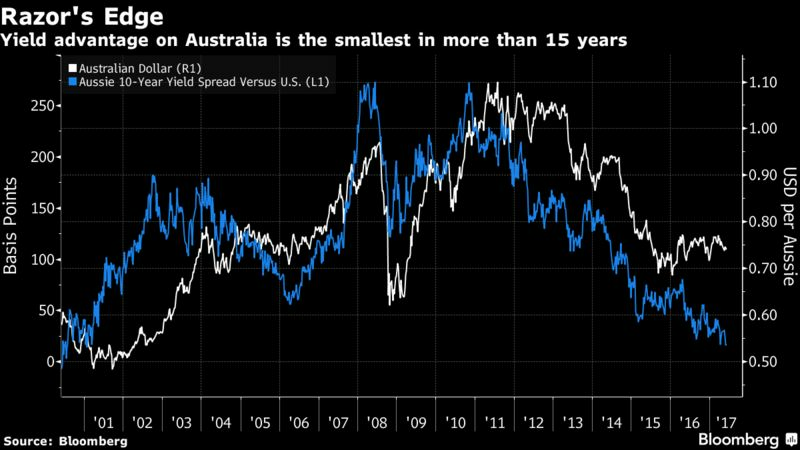 The last time the yield premium was that low on a consistent basis was in 2001, when the Aussie dollar hit a record low of less than 48 US cents. 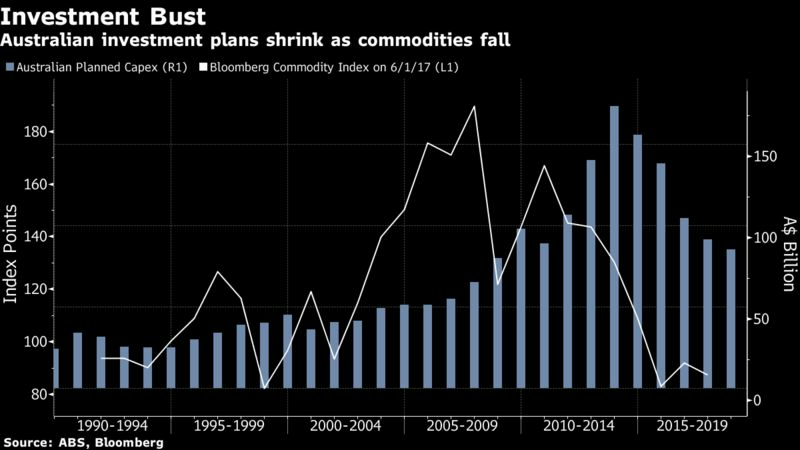 As commodities come crashing down, including the steepest three-month slide since 2008 for iron ore -- Australia's biggest export earner -- local businessmen are reacting by pulling in their horns. Government data on Thursday showed investment plans for the 12 months to June 30, 2018 dropped to A$85.4 billion ($87.4 billion), the lowest level since 2008 and less than half the peak reached in 2013. Aussie angst is also reflected in what's going on at the nation's banks. 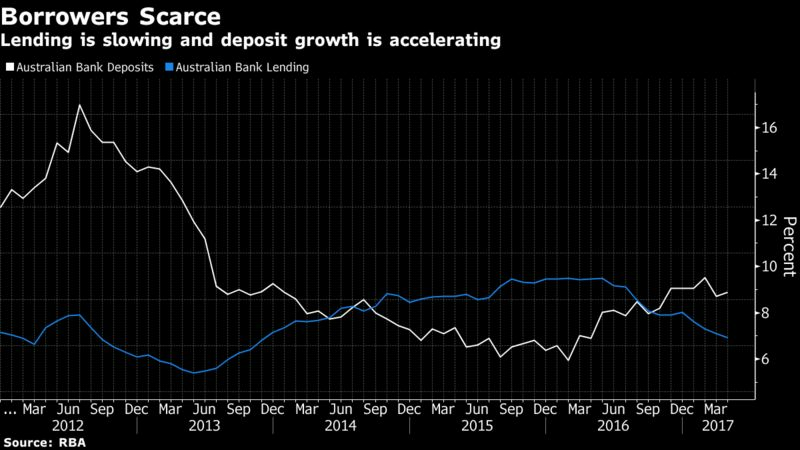 Deposits are growing at a faster clip after hitting a trough in February last year, even as benchmark interest rates and wage growth are at unprecedented lows, while lending expanded at the weakest pace in 3 1/2 years. The upshot is that Australian consumers, much like businesses, aren't happy. Sentiment has remained negative this year through May for the first time since the depths of the global financial crisis in 2009. 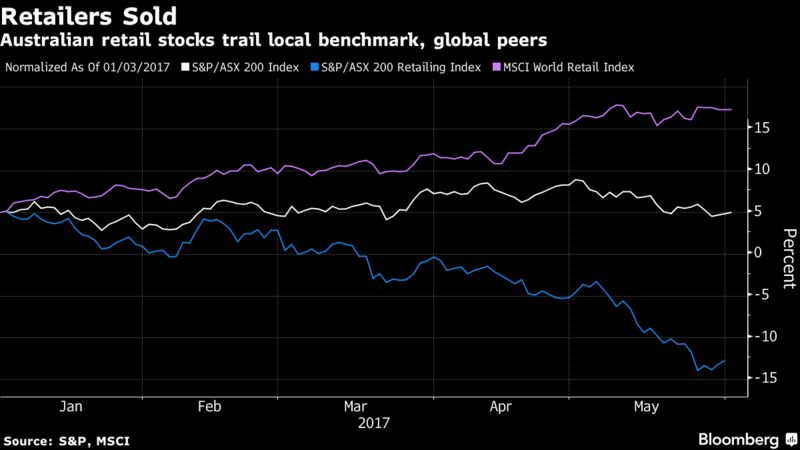 That’s left retailers reeling, hurt car dealerships and made investors bearish on mall operators. They did bounce back Thursday as data showed an unexpected 1% surge in retail sales for April. However, much of that strength may be due to a rebound in Queensland following a destructive cyclone and temporarily higher food prices as a result. Qantas Airways at least isn't letting the outbreak of Australian angst get it down. The airline's stock is up more than 60% over the past year after CEO Alan Joyce engineered a turnaround by cutting thousands of jobs, deferring aircraft, retiring older planes and dropping unprofitable routes. The country itself will be looking for something similar if Australia is to hang on to its unique record as the only major developed economy to have stayed out of recession since 1990. First-quarter GDP growth data is due next week and economists at some of the nation's biggest asset managers have been saying the economy may have come close to stalling.